Pine is a versatile wood that has a natural charm and beauty all its own. These characteristics make it a popular choice for all types of furniture--from tables to headboards. Because each pine board is unique, each piece of furniture will be as well. Here are a few of the many things to keep in mind when you are selecting pine furniture for your home or office. Look at the detailing of the piece itself. The wood is easy to work with and hand crafted furniture may have intricate detailing that is a trademark of the builder. Choose the detailing that will be easy to clean and complement your existing pieces. Choose a piece with legs, doors or railings that are similar in style to the pieces you already own. Check any pieces that are attached with screws or hinges to ensure that they are firmly and solidly attached and that doors close properly on cabinets. Pine furniture can be easily dented or scratched. Check your piece very carefully for obvious damage which will decrease the life of your new purchase. If you are purchasing an antique piece, look on the underside as well because structure problems could be hidden. Consider the type of stain or finish you want for your piece. If the furniture has been previously stained, you will want to choose something that will work well with your decor. It is not difficult to paint over stained pine if the color isn't exactly what you have in mind, but it will be a challenge to remove the stain if you plan to stain it another color. Because pine is often unfinished, it offers a huge advantage in the way of versatility. Remember that pine is comprised of soft and hard wood so it will absorb stain at different levels. Your best bet is to coat the furniture with a sealer first which will allow the wood to absorb stain evenly. Remember that the stain will go on slightly darker than the color in the can, and you may even need two to three coats. Although knots are undesirable among most furniture grade lumbers, knotty pine is prized for its rustic character. Pine, a softwood, stands out as an odd fellow among the hardwoods that dominate furniture manufacturing, such as oak and mahogany. Despite pine's easily dented flesh and sometimes indistinct grain pattern, furniture makers routinely choose pine for outdoor furniture creations and rustic-inspired interior furniture. With an understanding of the species and grades of pine commonly used for furniture manufacture, you can choose the right one for your project. Pinus strobus, the eastern white pine tree, grows in several areas of Canada, the northeastern United States and Appalachia. As a result of its relatively rapid growth rate, commercial growers plant and harvest large stands of eastern white pine. According to the University of Wisconsin, eastern white pine flesh has medium strength and easy workability. Workability is a term that describes a lumber's reaction to tooling, such as cutting, drilling and sanding. Lumberyards use the term "southern pine" to refer to several pine species, including slash pine, shortleaf pine, longleaf pine and loblolly pine. Southern pine species grow throughout the southeastern United States and many varieties are commercially available for furniture applications. According to Auburn University, many of the southern pine's characteristics are suited to furniture making, including excellent workability, high glue-bond strength and resistance to splitting and cracking during fastening. The New Zealand Pine Manufacturers Association grades pine both for use in New Zealand and for global export. Lumber manufacturers refer to high-quality pine suitable for furniture making as appearance grade. Appearance grade New Zealand pine is either completely free of knots or possesses only minor knots. Lumber suppliers refer to knot-free lumber as "clear" lumber. Lumber grading authorities, such as the Northeastern Lumber Manufacturers Association (NLMA), recommend select and appearance grade pine for furniture and finish carpentry work. Although specific grading requirements vary according to grading authority, select and appearance grades share similar traits. Grading authorities inspect lumber for blemishes and stamp the lumber according to their findings. Select grade pine generally merits the highest standards. 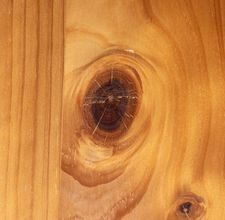 For example, the NLMA's select grade pine may have only one knot per every four surface feet of lumber.